Inspired by the corner junkyard that stood until last year at the intersection of Wyoming Highways 14 and 16, John Hull has created a series of narrative fiction paintings that explore what life might have been in that place. The series began when Hull was an artist-in-residence at the Ucross Foundation in 2002. John Hull: Pictures from Sonny's Place was curated by Gordon McConnell and originated at the Ucross Foundation. 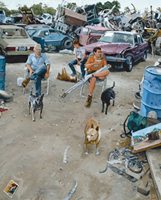 In her essay for the exhibition catalog, Annie Proulx says this about John Hull's work: "For decades artists of all kinds came to Ucross to paint, draw, sculpt, print and photograph, but until John Hull, whose reputation as a major painter of our time continues to grow, apparently no one thought the junkyard a worthy subject. . . . His treatment of landscape littered with old pipe, abandoned trucks and tires is what photographers, dodging the glazed beauty of Ansel Adams' work, were calling 'the new topography' a few years ago, but Hull is not judgmental, not as propagandistic. The stuff is there because it's there - landscape as fact. Hull's paintings evoke visceral and psychological responses, most often recognition of the familiar. All Wyoming people know this west." Hull is a Professor of Painting and Drawing at the University of Colorado at Denver. He has an MFA from the University of Illinois and a BA from Yale University. He has exhibited extensively and is represented in the collections of the Metropolitan Museum of Art in New York, the Denver Art Museum, the Israel Museum, and the New Museum of Contemporary Art. Funded by UW Cultural Outreach, the National Advisory Board of the UW Art Museum and the Wyoming Arts Council through the National Endowment for the Arts and the Wyoming State Legislature.